Learn how to stop playing the blame game when mishaps occur. Blame. It’s a dirty word. It implies failure, even negligence. It’s no wonder then why so many of us are tempted to play the so-called blame game, where we rush to find a scapegoat rather than accept responsibility for mistakes. The blame game, though, unleashes a storm of destruction. In fact, according to Psychology Today, the blame game is among the “most destructive” of human habits –– sparking everything from war to road rage to general unhappiness. The good news is, in a world filled with finger pointing, you can live a fuller life by refusing to play the blame game. If you find yourself in the midst of a blame storm, seize control by following these powerful tips. Even if you’re absolutely certain that the negative turn of events you’re experiencing is someone else’s fault, think about the role you may have played in the situation (no matter how little). Say an employee botched an assignment you gave him –– think about whether or not you could have communicated better to prevent the mix-up from occurring. Or perhaps you could have chosen another employee with a different skill set to complete the task. Get a piece of paper and diagram the sequence of events leading up to the mishap. Then, circle where you could have stepped in and handled things differently. Forgiveness can be challenging, especially if you’re dealing with an individual who’s made a series of mistakes or if their negligence has you facing serious consequences. Big or small, try to forgive others’ faults. If you’re a person of faith, you’re called to extend grace to others. If not, extend forgiveness simply because you’re hardly perfect either and may also need forgiveness for a misdeed in the future. If forgiveness doesn’t come naturally to you, consider writing a letter addressed to the person you’d like to forgive. You don’t need to actually send the letter. Just express your thoughts about the mistake, why it hurt you and why you’re choosing to forgive anyway. This technique can help your angry feelings dissipate. Face it. Sometimes mistakes or tragedies occur through no fault of anyone. A phrase has even been coined about such events –– “freak accidents.” Acknowledge that neither you nor the others involved in the situation could dictate the outcome. Instead of making someone else a scapegoat, try to learn the lesson from the situation and move on. You can reflect quietly at night or in the morning for 15 minutes until you see the way through the mistake. 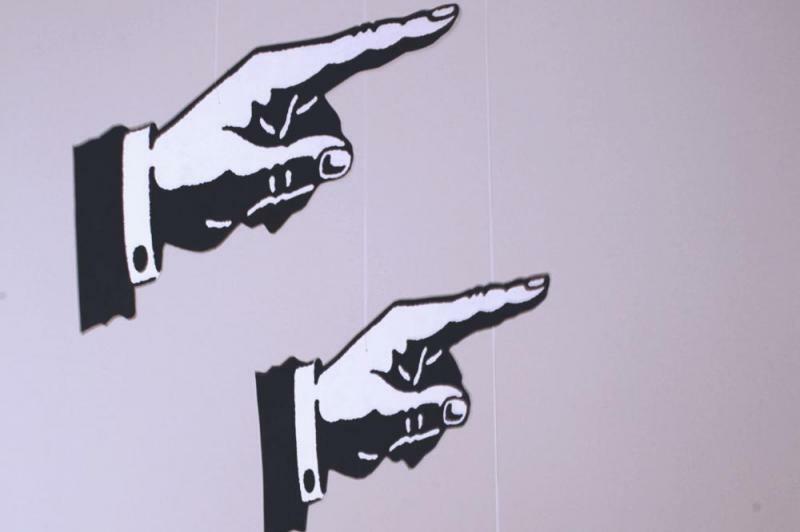 Pointing the finger at others when mishaps occur does far more harm than good. The blame game leads to feelings such as resentment, guilt and anxiety. Find a healthier coping mechanism when things don’t go your way. Ask for advice, reach out to others for support or simply give yourself time to bounce back from a failure. You’ll feel much better trying these methods than making other people victims.